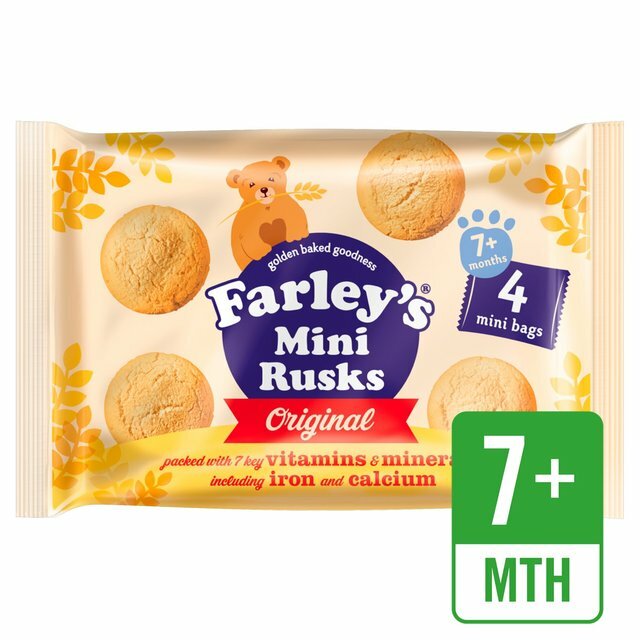 Farley's mini rusks are the perfect snack for when you are out and about. Great as a delicious finger food to encourage self-feeding, hand-eye coordination, biting and chewing as your baby develops. Or simply crush in a bowl and mix with your baby's usual milk to make a smooth puree. For maximum freshness once individual bags are open, store any Mini Rusks in an airtight container. Store in a cool dry place away from odours. REMEMBER TO BRUSH TEETH REGULARLY. For maximum freshness once individual bags are open, store in an airtight container. Store in a cool dry place away from odours. Packed with 7 key vitamins & minerals including iron and calcium. Farley's Rusks have been loved by mums and babies for generations. Each bag of Mini Rusks provides 35% of your child's daily iron requirements. Each rusk is lovingly baked using baby grade ingredients.